Building a healthy lifestyle can be hard work – especially for truck drivers, who are constantly on the go and constantly under pressure to be on the go. But the rewards that accrue when truckers live and work more healthfully are nothing to sneeze at, from being safer on the road to incurring lower medical and insurance costs to enjoying a higher quality of life for themselves and their loved ones. Trucking companies benefit as well when their drivers are healthier. By implementing driver-oriented wellness programs, fleets are likely to see accident rates drop, which lowers operating costs and liability exposure. And driver satisfaction goes up, which cuts turnover and attracts new hires. While no one opens a trucking company to hang out a medical shingle, a trucker’s workplace is the logical place to reach out to him or her about medical or lifestyle issues that could threaten their livelihood or physical well-being. Think of a driver health and wellness program as a home base drivers can start from and return to for general information as well as specific guidance. Education, not scolding, should be the key aim. Recognition and/or incentives can be deployed to encourage drivers to make healthy changes and attain various goals, such as reducing weight and quitting smoking. While it may seem that everywhere you turn, there’s new health data to absorb, any number of unbiased studies point to where fleets could direct their efforts to boost driver health and wellness. 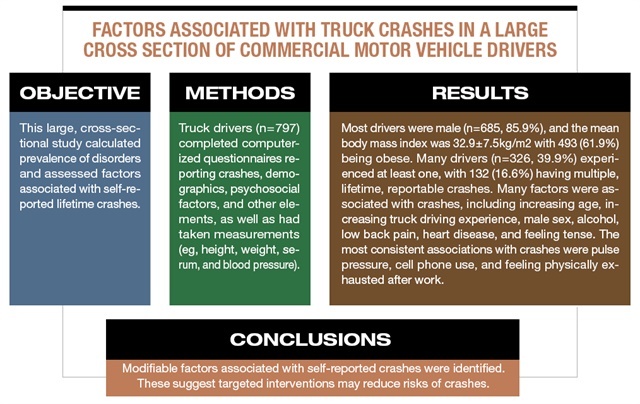 This research also highlighted a core underlying matter: Truck driver health is not well managed. Nearly 24% of the 797 long-haul truckers surveyed were determined to have high blood pressure (each received a basic physical exam) that had not previously been diagnosed and which was not being treated medically. The researchers also found that, similar to previous studies, 62% of the drivers were obese — that compares to 35% of the general adult population, according to the Centers for Disease Control. Then there’s a National Institute for Occupational Safety and Health study that found 88% of the 1,670 long-haul truckers surveyed had at least one of three risk factors (hypertension, smoking, obesity) for a number of chronic diseases. Along with the hidden killer of hypertension and the threat of death by fatigue or distraction, another major concern for many truck drivers is developing Type 2 diabetes. Not only will that threaten their health over the long term, but also more immediately, their qualification to hold a CDL. Mental health should not be ignored, either, including active alcoholism and drug addiction and also untreated major depressive disorder. When you think about the inherently sedentary nature of truck driving coupled with long periods away from home spent literally on the road, it makes sense to look at driver health from a holistic perspective. For example, a driver who is at risk for or has been diagnosed as hypertensive may also be suffering from sleep apnea or be at risk for diabetes. What’s in a wellness program? Wellness programs should at the very least aim to educate drivers on what their health risks are and what they can do to reduce them. Some fleets may limit their outreach to providing health information and insights to drivers on a regular basis, such as via email bulletins and the like. Others, convinced of the payback potential in lower operating and recruiting costs, not to mention simply improving the lives of employees, may go so far as to install workout gyms for drivers and even on-site medical clinics. At their best, wellness programs will screen for health issues to identify them for drivers as early as possible and then offer advice on treatment options and behavioral changes that will lessen the severity or onset of these conditions. In addition, fleets can motivate even the healthiest of drivers to eat, sleep and work as healthfully and safely as possible by rewarding them for reaching pre-arranged lifestyle or medical goals. Estimates of ROI for wellness programs range from about $2.00 to $5.00 per employee, according to healthcare consultancy Health Advocate Inc. “Studies have shown that increased productivity and retention of employees can be credited to specific components such as weight loss and stress management programs,” the company advises in a white paper. However, a recent study by nonprofit Rand Corp. of 10 years of data from the wellness program of a Fortune 100 firm found a sharp difference in payback between initiatives that promote lifestyle changes to prevent developing conditions (such as quitting smoking) and those designed to help employees manage chronic diseases already afflicting them, such as reminders to take prescribed meds. It was determined that the disease-management aspect of the program alone generated 87% of the healthcare cost savings. That amounted to $136 in savings per employee per month, largely driven by a nearly 30% drop in hospital admissions. What’s more, only 13% of the employees took part in the disease-management component. “Put differently, the much higher participation in the lifestyle management component contributed only slightly to the overall savings,” notes Rand. There are also legal words to the wise to consider. In an employer guide to wellness white paper, the Transamerica Center for Health Studies points out there are requirements imposed by the Americans with Disabilities Act, Health Insurance Portability and Accountability Act (better known as HIPAA), and the Affordable Care Act (aka Obamacare) that must be met. “Generally, workplace wellness programs must be voluntary, non-discriminatory, be reasonably likely to promote health or prevent disease, and protect the confidential health information of their employees,” it explains. 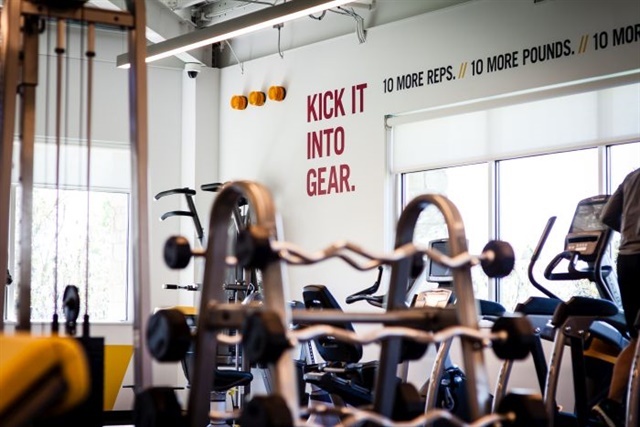 While there is no single best way to design a workplace wellness program, launching various driver-health oriented initiatives can help fleets cut the cost of healthcare as well as life and disability insurance, reduce turnover and boost recruitment. The first step is to measure what needs doing by assessing the state of your drivers’ health and health risks. This is usually done by asking each driver to complete a health risk assessment and undergo biometric screening. HRAs, in print or electronic form, seek driver input on such risk factors as smoking, obesity and stress levels. Biometric screening captures baseline blood pressure readings, height/weight measurements and cholesterol and blood-glucose levels. All this information will reveal those at risk so they can be encouraged – but never forced or coerced – to take part in programs offered by the fleet that are personalized to help reduce their risk of developing chronic disease and/or to better manage any disease conditions already affecting them. The Small Business Administration suggests several sources for help putting together a wellness program. At the top of its list is the Centers for Disease Control, which provides online tools to design and structure programs. Among these is CDC LEAN Works, a free web-based resource that includes an obesity cost calculator to estimate how much obesity is costing a company and how much in savings could be gained with different sorts of workplace programs. SBA also recommends consulting your healthcare insurance provider, as many now offer tools and resources to help employers develop programs, and checking in with your local SBA small-business assistance group or Chamber of Commerce to see what resources or seminars they may offer. Jazrawy of CarriersEdge points out a telling trend of how carriers have approached wellness programs over time. At first, she says, most fleets were providing health tips to drivers. Then, fleets started implementing weight-loss and stop-smoking programs along with blood-pressure monitoring and having on-site nurses available. Fleets also started hiring diet and fitness trainers, putting in walking tracks and gyms at facilities, and began offering in-cab fitness equipment. Some carriers launched sleep-apnea testing for high-risk drivers. Some promote wellness company-wide, including hosting participation-driving events such as marathons and polar swim plunges.